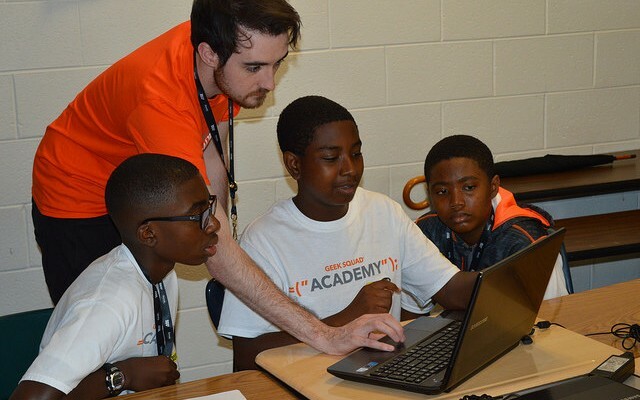 Geek Squad Academy was peachy keen in McDonough, GA! Geek Squad Academy went to McDonough, GA for the first time with remarkable success! We would like to thank Eagles Landing High School, specifically Ms. Brew, for hosting our 200 Junior Agents from 100 Boys of Code and 100 Girls of Code. These students were able to be technology creators, instead of just consumers, by learning about robotics programming, 3D design, digital music, website coding, circuits and logic, as well as how to be safe on the internet. Finally, we would like to thank our Geek Squad and Best Buy employees who came from all over Georgia to help make this camp successful.